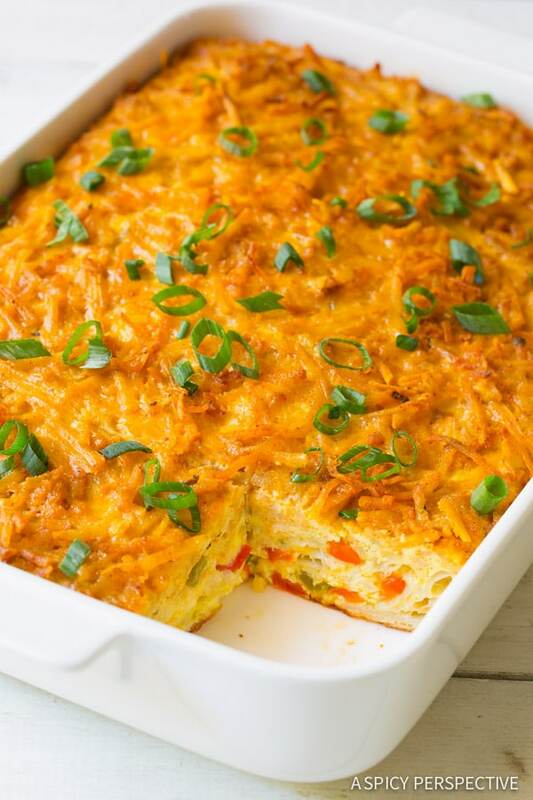 Fluffy Mexican Breakfast Casserole with Hash Brown Top – An irresistible Hash Brown Casserole with a golden crusty potato crust and tender layers of eggs, cheese, tortilla, peppers and chiles. If you’re bored of the same ol’ breakfast every morning, I feel your pain. Protein shakes, cereal, and oatmeal get old after a while. Lately, I wake up in the morning hankering for something slightly out of the norm. 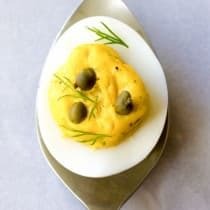 If I think about what I’m craving long enough several things repeatedly come to mind… Eggs, hot cheesy goodness, spice, and a soft-crispy textural balance. That is a combination I could never get tired of. 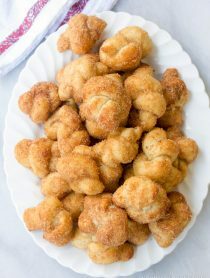 So after fantasizing over the perfect breakfast for days and days, I finally have a recipe to share that fits the bill. 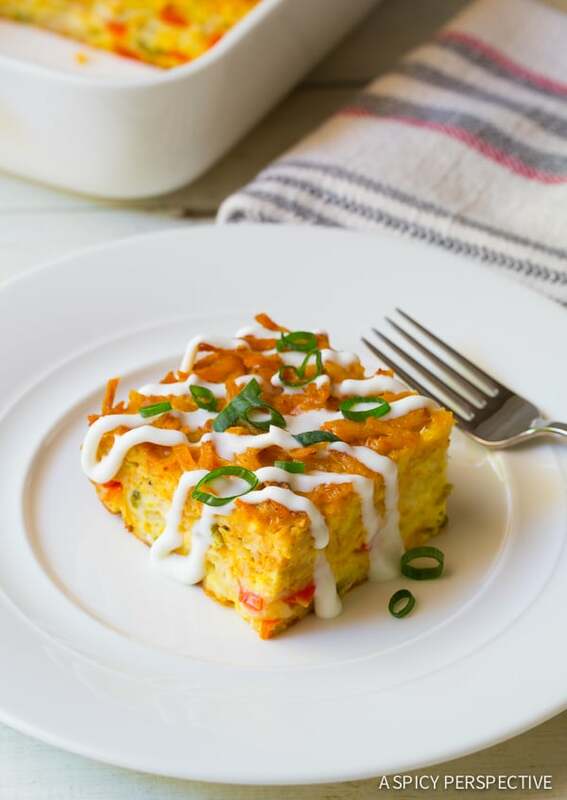 Today’s savory Mexican Breakfast Casserole with Crispy Hash Brown Top is a morning breakfast bake I can’t seem to get enough of, and neither can anyone else who’s tried it. Fluffy eggs and tortillas, molten cheese, red peppers, green chiles, and a crispy golden crust that rivals the brilliance of the rising sun. This is a breakfast worth getting up for in the morning. My Mexican Breakfast Casserole with Hash Brown Top starts with a simple mixture of eggs, cheese, and chopped flour tortillas. Then I added onions, red bell pepper, and spicy Old El Paso Green Chiles for flavor. The chiles give the breakfast casserole spicy Mexican appeal, while the tortillas absorb some of the moisture and help the casserole puff up in the oven. 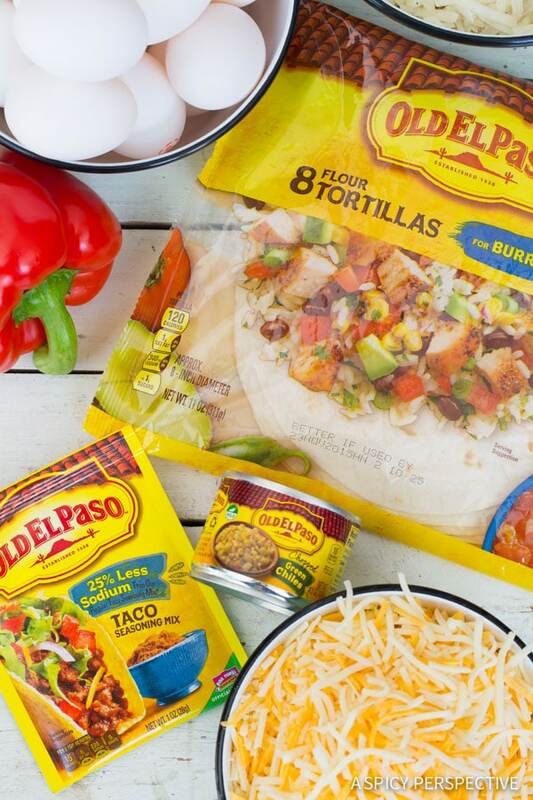 Mixing tender Old El Paso Flour Tortillas into the the mixture also serves another purpose. It gives the egg mixture stability, so it can hold up the amazing golden hash brown crust! For the Hash Brown Top, I combined thawed hash brown potatoes with Old El Paso Taco Seasoning and melted butter. The taco seasoning coats the shredded potato giving it zesty flavor and color. While the butter ensures the topping crisps in the oven. Just look at that crusty potato top! 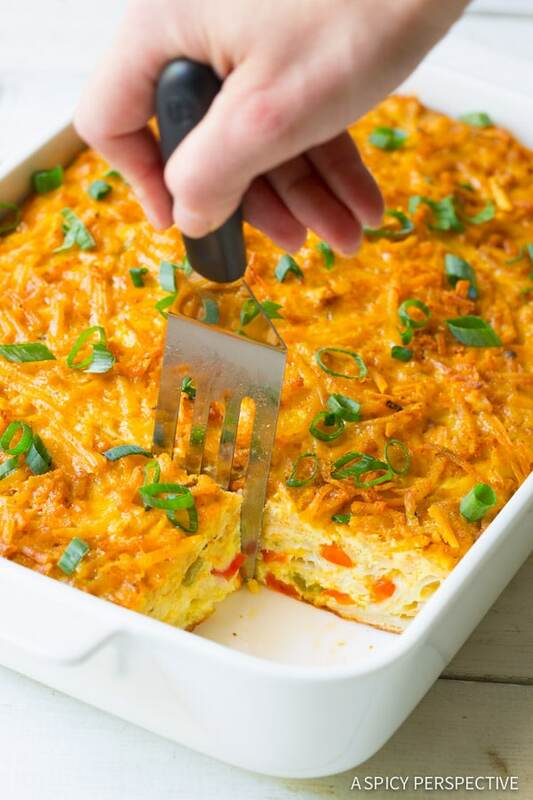 Every time I pull this easy Mexican Breakfast Casserole with Crispy Hash Brown Top out of the oven, big smiles follow. 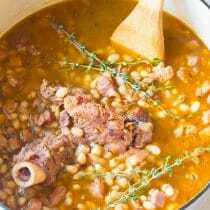 It’s soft and fluffy with a crusty top that will keep you coming back for more. 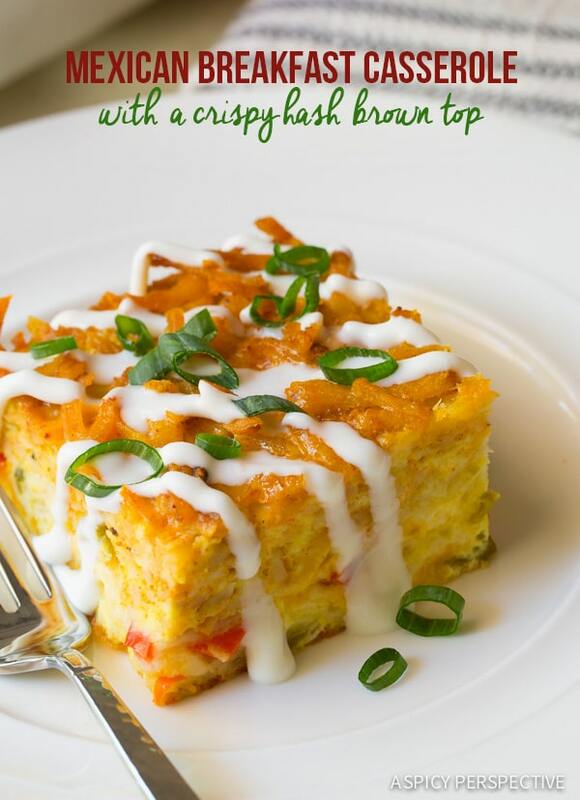 Our Mexican Breakfast Casserole with Crispy Hash Brown Top is a fabulous breakfast idea for holidays and family reunions. It makes twelve hearty servings you can dish out all at once, or wrap and serve each piece individually, all week long. 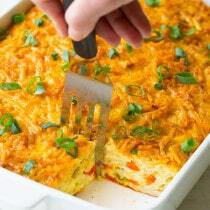 Mexican Breakfast Casserole with Hash Brown Top – A Hash Brown Casserole with a crusty potato top, and fluffy layers of eggs, cheese, tortilla, and peppers. Preheat the oven to 325 degrees F. Spray a large 9 X 13 inch baking dish with non-stick cooking spray and set aside. 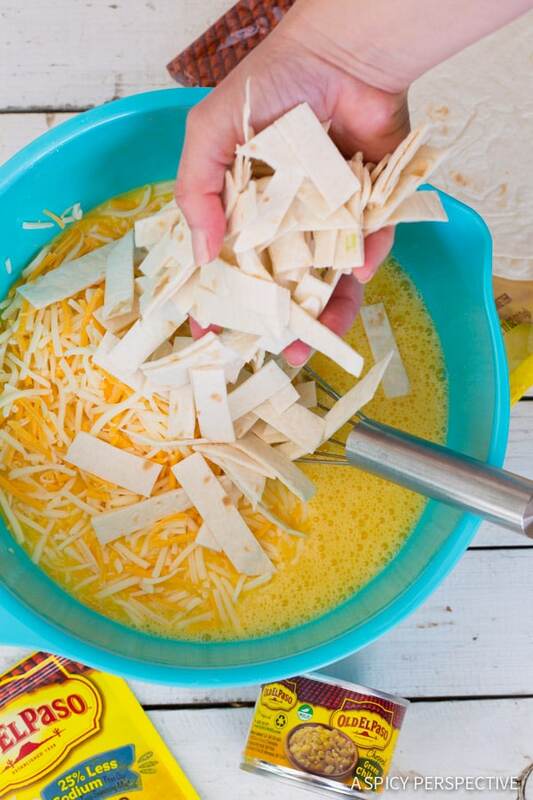 Cut the tortillas in to 1/2 inch by 1 inch strips. Whisk the eggs thoroughly in a large bowl. Then mix in the shredded cheese, chopped bell pepper, chiles, 1 cup chopped green onions, salt and tortillas. Pour the mixture into the baking dish. 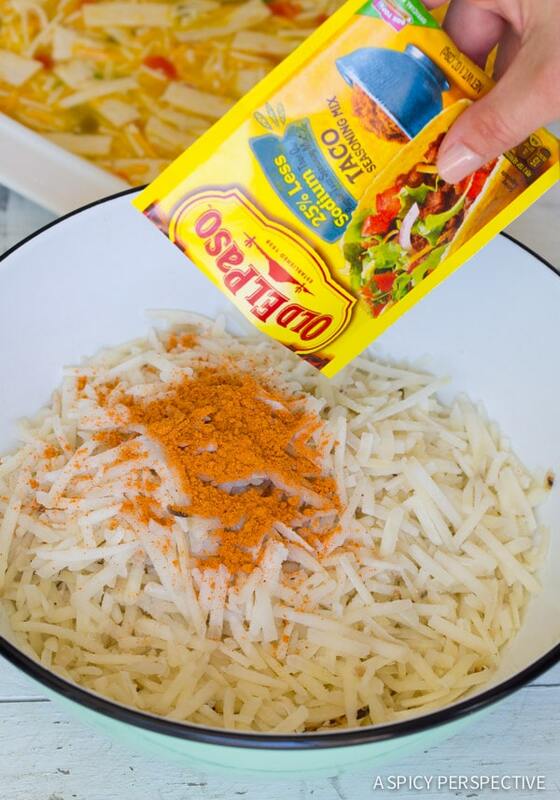 In a separate bowl, mix the shredded potato with the Old El Paso Taco Seasoning. Then drizzle the butter over the top of the potatoes and toss to coat. Sprinkle the shredded potatoes over the egg mixture in an even layer. Then place in the oven and bake for 50-60 minutes until the center is puffed up and the hash brown top is crispy. Serve warm, drizzled with crema and sprinkled with green onions. Hi Sommer, I love mexican breakfast! Sommer, Delicious! I wonder, but a lot of calories? 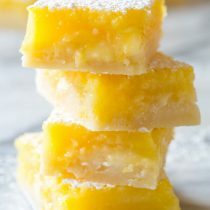 Quick question: can this be made late in the afternoon and refrigerated for baking and serving the next morning for brunch? Yes, it can be prepped ahead! However, I would still add the hash brown layer right before baking. Sommer, Thanks for the recipe, it’s delicious! 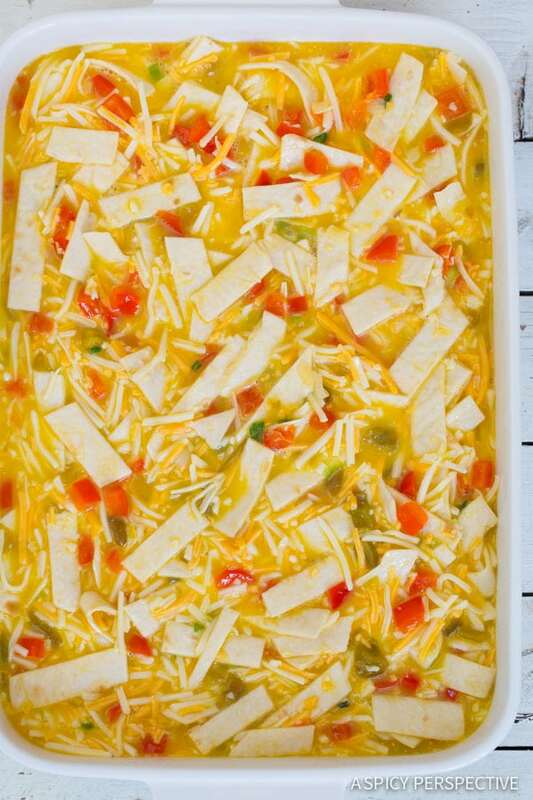 Great Mexican casserole! I’m a big fan of Mexican food – this one with cheese and eggs is so tempting than the usual breakfast with just vegetables. I’m gonna try it right now. I’m sure it’s going to be awesome. Made this twice for large groups and loved it! So much easier to put together and slice and serve than a traditional bread based breakfast casserole. A very small amount leftover, I cut into little squares and they reheated perfectly. Did not mix the taco seasoning in with the potatoes, instead added Johnny’s seasoning salt and it still gave it nice color and flavor, the chiles, red pepper, onion and fresh salsa I served with gave it plenty of Tex-Mex zing. Thanks for yet another great recipe Sommer! This was really tasty. It just needed black pepper, a bit more salt and one more can of chillies. Perhaps some cheese mixed in with the hash browns?? I could seriously eat this for breakfast every single day! I am such a SUCKER for a good cheesy breakfast casserole! That crispy top looks great!! I could have breakfast for dinner with this!! 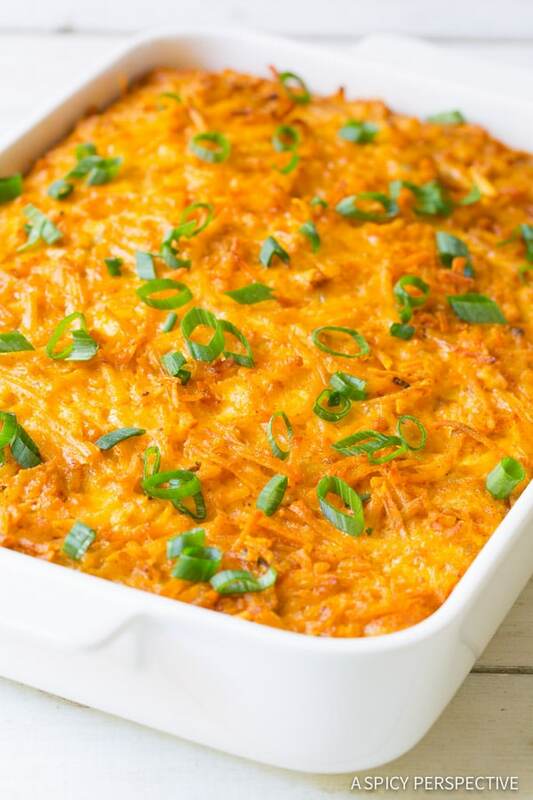 This is one yummy looking casserole! Have to try it! This is an awesome brunch idea! It will be a huge hit in my family, we all love mexican to death. Can’t wait to try it! LOVE that hash brown crust! 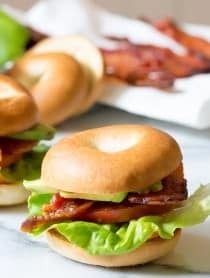 Love this zesty breakfast recipe! Mmm! Yesssss! This would be perfect for brunch this weekend. And love the addition of the hash browns! I’m loving everything about this dish, especially that crispy crust! 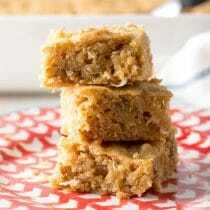 Can’t wait to make this for my family! Whoa! Sommer this look so good! Loving all the Mexican flavors packed into one breakfast! 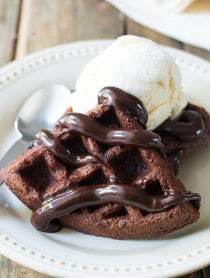 This looks sooo yummy! I’m always looking a way to add more Mexican flavors into my life!